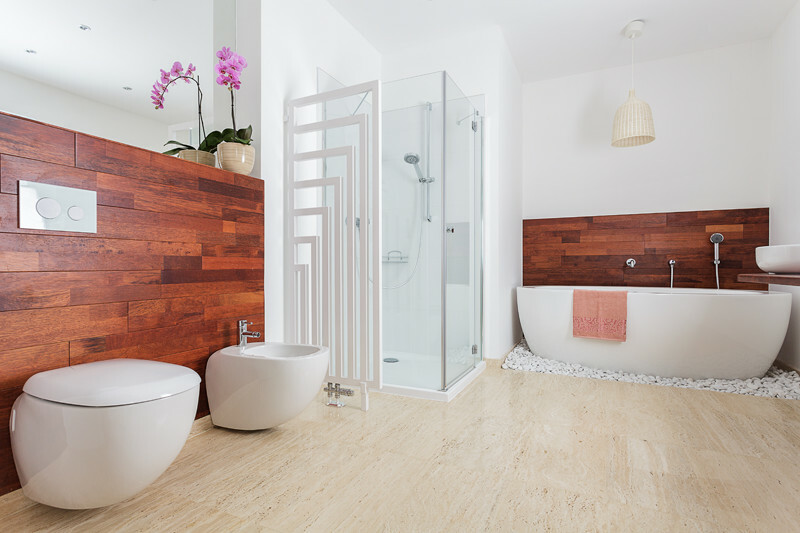 Considering remodeling your master bathroom? Building a brand-new one? Now’s the time to consider adding a little luxury into your master bathroom designs so that you can create a personalized retreat in your own home! Gone are the days when an environment of relaxation and indulgence are restricted to day spas or luxury hotels. Today, homeowners are looking for new ways to make their home bathrooms the peaceful escape they’ve always wanted. And nowhere is this truer than in the master bathroom. Since the master is an extension of the master bedroom, many people look for master bathroom ideas that complement their home’s style. Limited only by your imagination and your budget, you can take your standard master bathroom to a new level with anything from all glass shower doors to frameless enclosures to creative layouts and more. Here’s are some tips to create master bathroom designs that really WOW! Establish your style. Not sure how to describe your style? Unsure you even have a personal style? No problem! There are tons of design books that you can find at your local book store that provide real-life examples. Better yet, your local shower manufacturer will likely have a showroom you can walk through to explore the possibilities with a decorator on hand to answer any questions. When taking on a remodeling bathroom project, it is best to work with a professional who has the knowledge and experience it takes to maximize the space. Paying a visit to a decorator gives you the chance to see bathroom designs firsthand to get ideas for yours. Master the materials. When considering master bathroom ideas, you’ll be hard pressed to find a material that’s too luxurious or too unusual. Today, homeowners are utilizing special high-quality materials like custom all glass shower doors, frameless enclosures, brushed-nickel hardware and more. After all, when you use the right materials, you’re more likely to enjoy the new design for years to come. Explore layout options. A custom floor plan requires the help of a professional bathroom designer who can analyze the size and dimensions of your space, and recommend the appropriate placement. Shower or bath. Master bathrooms ideas have changed over the years. Today’s spaces feature walk in showers with frameless glass doors, overhead showerheads and steam showers. However, to achieve the same level of luxury, bathtubs are also being housed by glass shower doors to offer the best of both worlds. Sinks. Visit most newer homes today and you’ll see that two sinks in the master bath is standard. But this is by no means a must-have. Many bathrooms feature more counter space, which decreases the plumbing costs that come the remodeling bathroom sinks. Give your needs careful thought before making this decision. Toilet. Master bathroom designs can go above and beyond the ordinary with a separate room for the toilet if you have the space. Mirrors. Custom-designed mirrors can do wonders to open up the space. Consider installing some large ones to catch light during the day and offer more visibility at night. Your master bath should be a quiet, peaceful escape, which can be tough to create with the hustle and bustle of the house and a noisy environment. Add some finishing touches like plush towels and fabric window treatments to round out the relaxing experience. These finishing touches will add that bit of luxury that will turn an ordinary bathroom into your very-own spa retreat!